The two men designed and built the course themselves. They bought an old used bulldozer and rebuilt it themselves. Then they cleared fairways, constructed tees and greens, built ponds and Arrowhead Golf Course became a reality. The McLeans said that they found arrowheads on almost every hole. 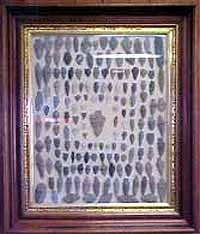 The pro shop shows a nice display of some of those arrowheads found during the original construction. They say you can still find arrowheads from time to time near the creek beds on the course. Arrowhead Golf Course has come a long way since that first nine holes in '54. The course now boasts 27 meticulously groomed holes, tee-to-green asphalt cart paths, manicured roughs, elevated greens, set in the rolling hills of rural Berks County. This mature course has tree lined fairways, including 2,500 Norwegian Pines planted back in the early '70s. The fairways are mixtures of Kentucky Blue and Perennial Rye, and the greens are bent grass, all irrigated with automatic sprinklers. Greenskeeper Steve Beidler has a degree from Rutgers University, and takes great pride in keeping the course perfect. Vernon Keller is the Crew Chief and Chief of Maintenance. Since John passed away in 2000, Arrowhead Golf Course has been owned and managed by John's wife Florence and third generation daughter Valerie. They are proud to carry on Donald and John's tradition of high quality greenskeeping, strict rules of golf etiquette, and making sure that a good time is had by all. There are actually two different courses, the nine hole Blue Course and the eighteen hole Red & White course. The Blue Course is a regulation par 35 course, at 2,505 yards, with one par 5 and two par 3's. It is a mature course that sits among the Allsort-Conglomerate rock and tree-lined fairways which provide a gorgeous scenery to this area. It is great for advanced players who want to sharpen up their iron game, and very forgiving for beginners. Golfers may play a round of nine, two rounds for 18, or a mixed eighteen of nine on the Blue Course and nine more on the Red course.